As most people are aware of now, the International Astronomical Union (IAU) is about to decide to "add" 3 planets to our Solar System by (re)defining what a planet is. It will not stop at 3, since there are many objects beyond Pluto that likely fit this definition and will be found in the coming decades. "Bad Astronomy" has an excellent article on the news: Congratulations! It's a planet! I think he hits the nail on the head when he describes the problem as being unscientific: the IAU is trying to construct a scientific definition to a cultural term which already seems to have its own meaning. The results aren't pretty, especially since one of our new "planets" is a moon (Charon)! However, a truly satisfying solution is hard to imagine. It hilights another related point that he makes in the article, the term "planet" has no real use in science anymore because it does not explain anything. Terrestrial, Jovian, and Pluton planets do not share the same explanation for how they were formed, not to mention that their physical and orbital properties are widely different (adding the asteroid Ceres makes a fourth category). It's one thing to add planets to the "back" of the Solar System, but sticking Ceres there in the middle really messes me up! Finally, NASA/ESA have released a movie of the Huygens descent. It is a downward-looking, fish-eye view starting from above Titan's thick, hazy atmosphere. It ends with the probe's landing and view of the surface. Quite thrilling (cool background music, too!). Ben orignally brought this to my attention and I have been following it since. All or almost all my favorite missions seem to be in jeopardy. That includes missions to look for life on Mars, Europa, and extra-solar planets. The main reason? Does anybody remember that silly "vision for space exploration" Bush promoted during his 2004 campaign for re-election? He directed NASA to return to the Moon and then send people to Mars. Very ambitious and very, VERY expensive, and having very little to do with science, but everything to do with politics. Alas, Bush allocated only a marginal increase in NASA's budget. Most unfortunately, NASA took him seriously (as it must) and now is cutting out the science from its budget. Needless to say scientists (specifically astronomers) are outraged. Some of the most highly promoted missions on NASA's scientific agenda would be postponed indefinitely or perhaps even canceled under the agency's new budget, despite its administrator's vow to Congress six months ago that not "one thin dime" would be taken from space science to pay for President Bush's plan to send astronauts to the Moon and Mars. The cuts come to $3 billion over the next five years, even as NASA's overall spending grows by 3.2 percent this year, to $16.8 billion. Among the casualties in the budget, released last month, are efforts to look for habitable planets and perhaps life elsewhere in the galaxy, an investigation of the dark energy that seems to be ripping the universe apart, bringing a sample of Mars back to Earth and exploring for life under the ice of Jupiter's moon Europa - as well as numerous smaller programs and individual research projects that astronomers say are the wellsprings of new science and new scientists. "The bottom line: science at NASA is disappearing - fast," said Donald Lamb, an astrophysicist at the University of Chicago and chairman of a committee on space science for the Association of American Universities. Representative Sherwood Boehlert, the New York Republican who is chairman of the Science Committee, called the new budget "bad for space science, worse for earth science," adding, "It basically cuts or de-emphasizes every forward-looking, truly futuristic program of the agency to fund operational and development programs to enable us to do what we are already doing or have done before." Astronomers and planetary researchers say space science has provided NASA's brightest and most inspirational moments in recent years: the landing on Saturn's moon Titan, the exploits of the Mars rovers and the stream of cosmic postcards from the Hubble Space Telescope. Despite Dr. Griffin's assurances, they say that delaying space missions can be a death sentence if there is not money to continue developing technology and to keep teams together until the mission is ready to fly again. That is the case, said Charles Beichman of NASA's Jet Propulsion Laboratory, with the Terrestrial Planet Finder missions, which are intended to produce images of Earth-like planets around other stars. They are the culmination of a line of missions devoted to hunting for planets around other stars and investigating if they are habitable or already harbor life, a goal, planetary scientists point out, that is explicitly endorsed in Mr. Bush's space vision. Much of the concern among scientists is for the fate of smaller projects like the low-budget spacecraft called Explorers. Designed to provide relatively cheap and fast access to space, they are usually developed and managed by university groups. Dr. Lamb referred to them as "the crown jewels in NASA's science program." In recent years, one such mission, the Wilkinson Microwave Anisotropy Probe, produced exquisite baby pictures of the Big Bang, while another, the Swift satellite, has helped solve a 30-year-old mystery, linking distant explosions called gamma-ray bursts to the formation of black holes. Explorers, Dr. Lamb said, are where graduate students and young professors get their first taste of space science. Until recently, about one mission was launched a year, but under the new plan, there will be none from 2009 to 2012. In a letter to Dr. Cleave last fall, 16 present and former Explorer scientists said, "Such a lengthy suspension would be a devastating blow to the program and the science community." One author of the letter, Fiona Harrison, a physicist at the California Institute of Technology, said she first learned from a news conference that her own Explorer project, an X-ray satellite observatory called NuStar, was being cancelled after several years of development. Dr. Harrison said that she had been invited to reapply in 2008, but that in the meantime she had to tell her graduate student to find another thesis project. Dr. Harrison said she was thinking of leaving the country or perhaps even the field of astrophysics. In another move last month, NASA reduced this year's budget for individual research projects by 15 percent, retroactive to last fall, taking money from researchers and their institutions that had already begun work. Many scientists said the roots of their plight lay in the Bush administration's refusal to ask Congress for enough money to carry out the Moon-Mars program, announced with fanfare two years ago. But others said they were partly to blame as well for pursuing an overly ambitious agenda in the face of cold realities like the Columbia shuttle disaster and concern about the mounting federal deficit. "People assume that when Congress votes for something they send extra money," Mr. Mather said. "They don't." Dr. Griffin and his colleagues, the scientists agree, have tough choices to make, but so far, the space scientists say, the choices have been made in a vacuum, without input from the community most affected, namely them. Last year NASA dismantled a longstanding network of scientific advisory committees, and while a new network is in the works, it is not yet in place. I can't believe I had missed this one... At work recently I am working on a problem where I have to use the simplex algorithm, which is used to do linear programming (not necessarily related to programming, but which is a way to optimize formulas subject to some constraints where both the formula and the constraints are linear, if you know what that means); simplex is fairly simple but potentially very useful, since linear programming has many applications.I hadn't used simplex in a while and I was reading about it. The simplex algorithm was invented by one George Dantzig, who did lots of other work on optimization, evidently. Dantzig's contribution's were significant it sounds like (incidentally, he was also the origin of the story about the math student who mistakes an open problem for homework, and solves it), and just speaking as far as the simplex algorithm, it is pretty important, being widely used in optimization, at least of linear problems. Since its invention several decades ago, some theoretically better algorithms have been propsed but interestingly, practically speaking simplex is still often preferable. Furthermore, it has a lot of historical significance for me, since I spent waaaay to much time on it and linear programming in college (we had a whole semester course on it... plus I did some course work on non-linear optimization in graduate school, which is related, though it does not use the same algorithms), besides being useful to me now. But anyway, the point of all of this is that Dantzig died just too weeks ago and noone told me about it! I'm sort of disappointed more people weren't talking about it. The NY Times had an okay obituary on him (though it is now an archive article and costs - part of the vast "not-quite-web"). Much has been made lately of Harvard President Larry Summers' comments about women in science. I don't know the background, except that I know some studies have been done on various biological factors in the past suggesting that women in general have a disadvantage in some areas based on specific abilities (which will not likely be good indicators at the level Summers is talking about: in academics). I can't really comment on this, or even Summer's comments, which I am not familiar with in detail. But, being a numbers kind of guy (person? ), I decided to be a good reductionist and look up some of those numbers. The Huygens probe set down successfully on Titan today. It lasted more than 90 minutes, which was longer than expected, apparently. Notice that in this case, Valparaiso appears to be snow free, while South Bend is getting plenty. 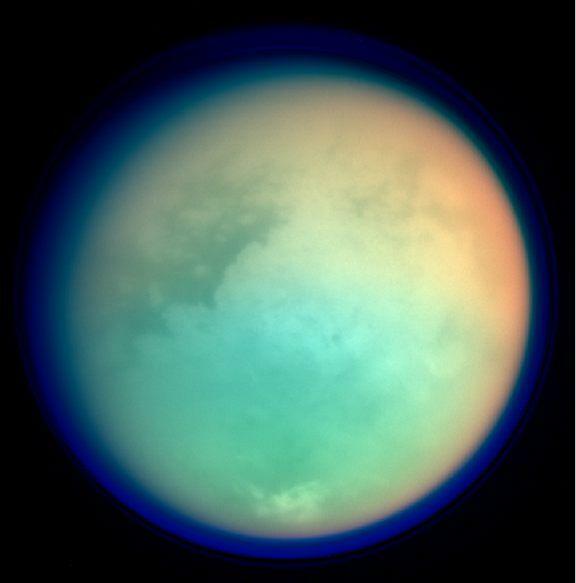 Titan in false color; blue is ultraviolet, red and green are infrared. Titan in false color again. This time, all three colors are different infrared wavelengths. 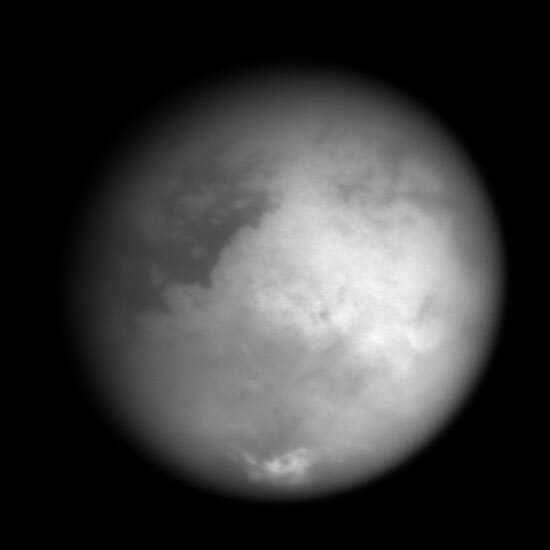 Image of Titan at 938 nm (near infrared), imaged by Cassini on October 24th. 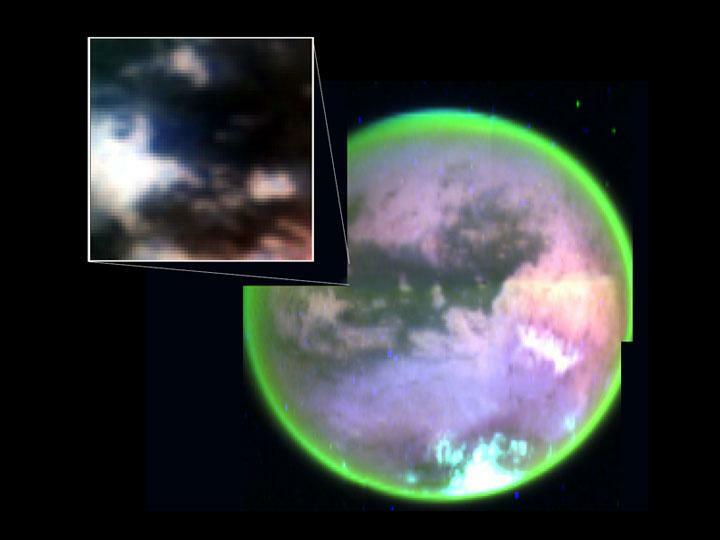 The spectrum Nasa is using penetrates the clouds of Titan well (in visible light Titan looks like one giant cloud). Nasa has a write up for this image. Nasa is planning more imaging for today. I was reminded today of a research project I was involved in back in college, when I saw a link to an article by Ivars Peterson about shapes with constant diameter (Peterson refers to the property as "constant width" in the article, but it is also called "constant diameter"). Constant diameter means that if you measure the width/diameter of the shape, regardless of its rotation, you will get the same measurement. Your first thought might be that only circles have this property. It turns out that other shapes can have it to. The Reuleux triangle is the most famous; it looks like a triangle with rounded sides. What is interesting is it has corners, yet because it has constant diameter it will still roll smoothly! There is a reason it is not used for wheels, though, as I will explain shortly. An easy way to come up with more such shapes is to take any polygon with an odd number of sides and round the sides. It is probably most interesting to compare the non-circles of these shapes to the circle. They all have the same perimter of the circle relative to their diameter: diameter times pi. Their area varies. The circle has the maximum area, the Reuleux triangle has the least. As I said before, all of these shapes roll smoothly (even the ones with corners) because they have constant diameter, which means they can be used as rollers. They can't all be used effectively as wheels, however, because they do not have a constant center of rotation (i.e. there is no point equidistant from all points on the shape's edge) in general, which is why only the circle makes it as a wheel (of course, the locus definition of a circle is the shape where all points are equidistant from the center). Anyway, a fun little piece of math trivia. And it shows that the circle is not as special as most people think! (And note that even pi shows up in the formula for perimeter - I remember thinking that was significant too; it somewhat breaks the exclusive association between circles and pi). Cassini, barely just now arrived at Saturn, has already been used for getting some data on Titan, Saturn's largest moon. Titan is possibly the most interesting thing that will be examined by Cassini (since, well, Saturn is basically just a giant ball of gas; though, the rings are starting to sound fun). Titan is one of the few bodies in the solar system with an atmosphere (and a fairly dense one; 1.5 times earth's - which is much more than most rocky bodies in the system), so it was already of interest. It has lots of methane, which makes exobioligists drool. And it has been speculated it has a fair amount of water ice. Titan's famous atmosphere has also made it one of the more enigmatic moons in the solar system, since its dense clouds have made observation difficult (well, that, and the fact it is really, really far away). 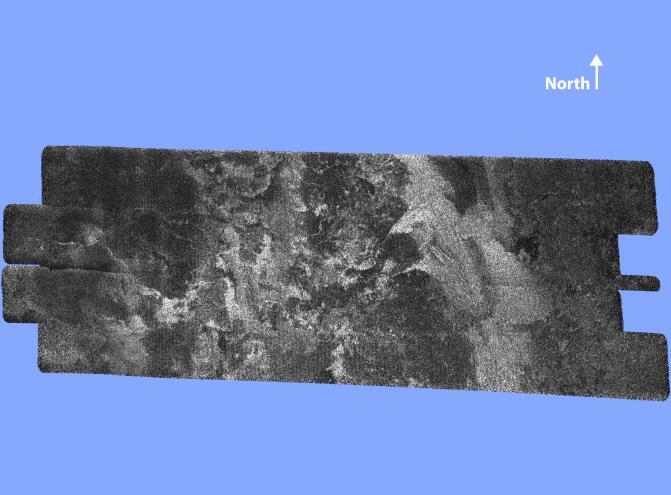 Well, the Cassini team has done some near-infrared imaging, which gives some idea of surface features (infrared light tends to pass through clouds better than visible light). They have also been doing some other surface imaging, but I don't know what frequencies or anything like that. Probably we will see better images in the near future. I keep an eye on their Press Release Images; usually (i.e. that's what happens with other NASA missions) the best stuff shows up there. Far more interesting than the current imaging, though, is the Huygens probe which is scheduled for a January landing on Titan.